Although ants are an irritant when they come into the home garden ants are not thought to carry any disaease. It is however virtually impossibile to know where the ants foraged for food last so it is wise to take measures to stop them entering your home and especially your food cupboards. Queens lay their eggs in the spring in nests that are typically in soil but can be in brickwork or under bark. Garden Ants are attracted to sweet foods and leave a pheromone trail back to their nests for other ants to follow to the food source. Always covering food – you never know where the ant has been before it crawls across your food! You can help prevent ants entering your home by sealing access points such as cracks and crevices in door and window frames. 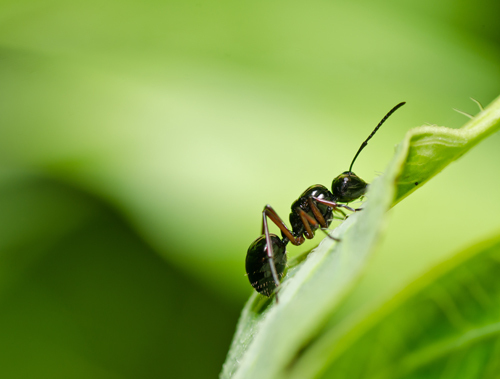 While DIY products can deal with smaller ant problems or with garden ants, for larger or multiple infestations of ants (and particularly if they are Pharaoh ants) a professional pest control service will be required. Our technicians understand the habits of each species of ants and also have a range of powerful insecticides to deal with ants and provide the reassurance that the problem has been fully dealt with. Call Pesky Critters to come and give you a free survey of all your pesky ant problems.